So what is it that makes this Festival so good we need to come again? The atmosphere of the entire day in 2011 was just brilliant – very many people enjoying a great day out in the sun. So why did we get it wrong and miss the festival this year? It was our understanding that it was always the Sunday after Bastille Day, so when we booked in March 2015 we guessed it would happen on the 17th July, however when we inquired at the Olive place they said it had been moved this year as it clashes with another local festival and they were going to see if it made a difference to the numbers attending! The decision is taken in January each year, so if we do decide to come again we will have to ensure that we are in Bize for the 3rd and 4th weekends in July and hope for the best. So what did we miss? Well a fantastic event as you will see from photos taken in 2011. This is Chris in the early morning just outside our gite – a street that was usually deserted. We reckon there were around 100 stalls selling all sorts of local produce, arts and crafts. Every corner you went round there were something new to look at. It really was a visual feast. There was even one youngster for sale! Even though he/she was very young she knew what to do and faithfully followed the adults - we suspect one of them was his/her Mum. But what has all this to do with the Festival dedicated to The Olive you may ask? Well it is a wonderful side show to the main event which is the making of alioli. With pestle and mortars, flour, eggs, garlic and olive oil to make alioli. It was a very serious business! 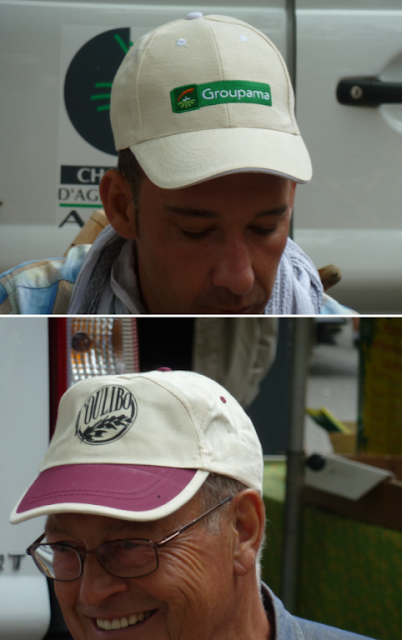 from two different olive Co-opertaives as depicted by the caps. The man at the top was the only one was any where near being young, so we wondered if he was being ‘trained up’ to replace others as they were no longer available! All washed down with the odd glass or so of vino. Finally there was a presentation of many prizes. Some got trophies and others beautiful pestle and mortars made from olive wood. Despite it all being done in rapid fire French we understood enough to be able to really enjoy the event. Once that was all over the promenade was given over to the more serious affair of feeding the 5000 and very nearly with loaves and fishes! This was my left overs! the Café du Midi for dinner where we were lucky enough to get a table outside. Mind you I popped inside to the toilet at one point and came back to find my chair had been purloined. He soon left me and went and found another friend! So that is what we missed, but just maybe we were saved a disappointment as sometimes things are not always quite the same the second time around. As much as we would love to stay in this house again we don’t think we will be able to as the people (Jules and Jess) we thought owned it sold it in March 2016 and they were just managing it for the new owners. They are honouring all bookings for this year, but will probably stop renting it out in the future. Jules and Jess do manage other properties, so I am sure we will find something that suits us. That really was the end and we were up bright and early on Saturday 23rd July and we headed off early for the long drive to an hotel just south of Paris. The highlight of the day – crossing the Milau Viaduct. We have done it before heading south which is even more spectacular, but it is still pretty good heading north. The weather was much better than on our way south five weeks ago and we made good progress. Mind we were glad we were going north as there was a lot more heading south as school holidays in the UK had started. On Sunday we headed to Sangatte to catch the Eurotunnel train home – we were booked for 6pm to give us loads of time for hold ups. We actually arrived at lunch time, were given the letter V and were on a train in less than an hour, so we were back home in Bromsgrove in time for dinner. The trip was amazing. It has been a joy re-living it all and marvelling at the almost constantly clear blue sky! and the not so welcome pile of mail – not too big after 5 weeks away as our daughter sifts through it regularly and bins all the junk mail. 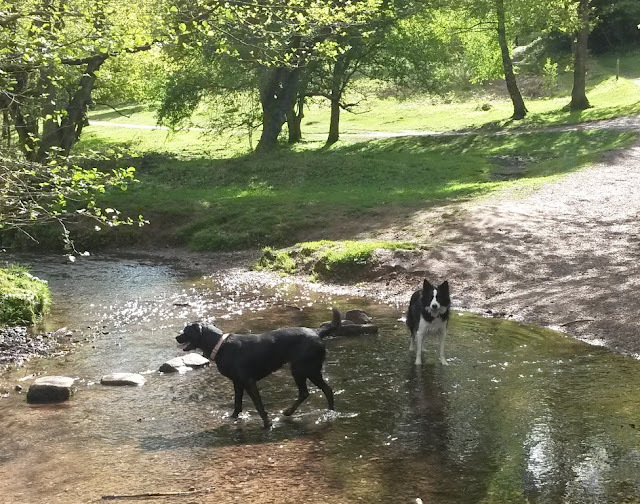 On the Monday we headed north to collect Monty who had had a wonderful time with our good friends, Jane and Chris and his best buddy, black Labrador Kiera. There were many walks on The Downs where Monty learnt that it is okay to get your feet wet and was known on occasion to go in up to his chest - he is not a fan of water! Then there are the cats - Guinness (he is the boss of the entire household!) and Henry. It took Henry a while to accept that Monty was not a threat, but just a very inquisitive young chap, but Guinness is much braver, but there is still a certain distance that is considered safe - this may just be a little too close! 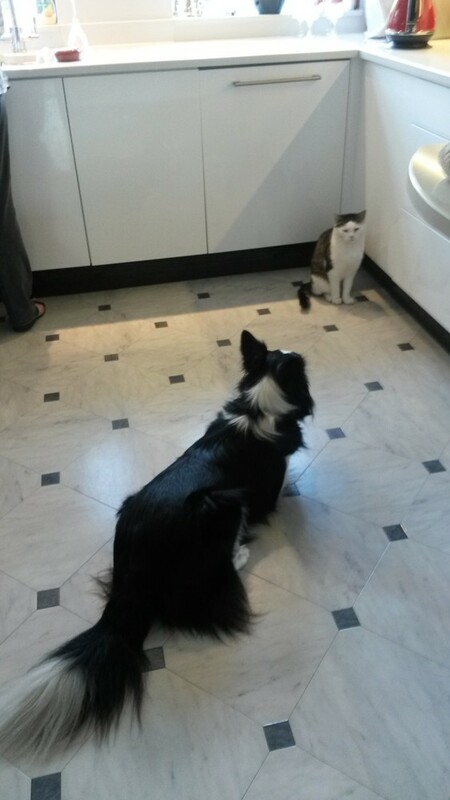 There were many 'nose swipes', but always with claws in - Guinness is a good teacher of 'cat manners'! An overnight stay with them was the perfect end to a blissful holiday and it was only to be another week before we saw Jane and Chris again at their daughter's wedding. If you have got this far - well done! Just St Richard's Festival (29 Apr to 1 May 2017) to go and I will be up to date. The next event is when we move Tentatrice up to the top of Tardebigge (20-21 May) for bottom blacking. This will have happened by the time this is published, so another blog to come soon! Chris' foot is getting better each day (he did lose the boot on the 27th April) and we hope to go off on the first part of our summer cruise in early June. At present he cannot get any shoes on so is wearing his sandals. He has discovered his wellies do fit, so they will be going on the boat for really non-sandal weather days! Today’s plan was to visit the above places, but it did not quite work out that way. It was all plain sailing until we neared Cap d’Agde – we were going to go from there all the way along the long sea front to marvel at the ziggurats, the number of tourists on the beaches and remind ourselves why it is just ‘not for us’! However, the traffic ground to almost a halt, so we turned off to head around the other side of the Bassin de Thau to visit Mèze, then Bouzigues and finally Sète. In case we do come down this far on a boat we wanted to check out mooring at all three places. 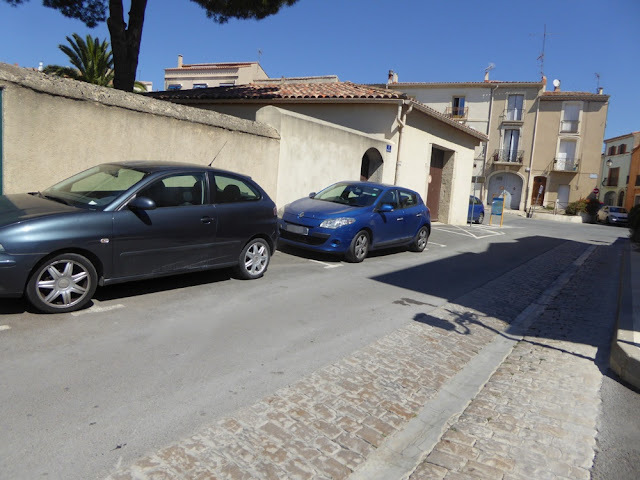 We wriggled our way around the one way system in Mèze, but found that the main car parking area by the port was shut today, so we gave up and went to Bouzigues. Mèze is an attractive place, so we may try again another year. We had much better luck in Bouzigues and found this nice easy parking space very close to the port. Well it was easy for me, Chris’s only way out was to negotiate the steering wheel and gear stick and then clamber over the passenger seat and the reverse to get back in! We visited Bouzigues in 2000 with Sue and Ken from nb Cleddau and remembered liking it and even having a paddle in the Bassin du Thau (famous for its oysters and mussels). This time it was the port we were interested in and what a delightful place it is. There are plenty of boats to admire - more of that wonderful sound of the wind rippling through the rigging. And round behind them is the visitor moorings – there are even electric points and water if required. Right behind these boats is a platform giving easy access to the sea if you fancy a dip. There is even a shower to rinse off the salt water. We would certainly never get a mooring like this in the UK! Children having fun in small sailing boats – closely supervised of course. Behind them you can see the oyster and mussels beds – they go on for miles. Surf boarders – again they seemed to be under instruction. We were only there for a short time, so I am sure there is a lot more to see. The boat coming in from the right is a trip boat which might make a pleasant trip one day in the future if we don't do the full boat trip ourselves. As it turned out we should have stayed in Bouzigues, but we had come with the intention of having a seafood lunch in Sète. Again this is a place we have been to before and have enjoyed some great food in the past. This time we were not so lucky and came away deciding that we will probably not bother going back again in the future. We had such fond memories of it as a place to wander, sit by the water, enjoy a good meal and watch the boats moving along the many canals. So what was the problem? The traffic – it was horrific (the above photo was taken in a rare moment of calm!) and as we failed to find anywhere to park above ground we headed down to an underground multi storey car park. For some reason once we entered we sat still in a snail’s pace queue as cars tried to manoeuvre in and out of very tight parking spaces. We even saw one lady give up and decide to use a disabled space and even though that was bigger she managed to reverse into a post with a resounding thud! It took us about 25 minutes to park in a space that was no more than 200 yards from the entrance! Worse still they charge by the 15 minutes. We only stopped to have a very quick wander and to have lunch – the cost to park was 5€60!! I rather think we made a bad choice of restaurant as well – we were on the other side of the canal from the pictures with no water side seating, so we were almost inside, the traffic was noisy and I made a poor choice of food. Chris fared better, but we have both said if we want a ‘seaside seafood meal’ in the future we would go to Bouzigues or Gruissan, both of which are closer than Sète. Well, all good things must come to an end and we deliberately left these last few days fairly free to relax and potter about before the long drive home as well as to think about the most depressing of chores – cleaning and packing! One thing left to do was something that is a ‘must do’ when visiting Bize and that is a visit to the Olive Cooperative just outside the village. Olives are a very important part of the agriculture of this area as well as the vines. A little further west and sunflowers predominate. East there is a more rice and vines, of course, are everywhere! And see the olives growing – in June they are still quite small as they are not harvested until Sep-Dec depending on the type they are growing and whether they are to be green or black. Along with quite a lot of boards with a lot of useful information. Neither of us realised what is involved in producing the olives we buy in the supermarkets. Now we know. And then you go inside. There are olives to try - we favour the Lucques which are the ones grown in this area. Just feast your eyes on a selection of what they have to offer – it is almost visual overload! Just the odd bottle of olive oil! You can try before you decide what to buy. Hiding on one shelf are tins of gésiers (gizzards!!) which Chris was brave enough to try one year, but strangely enough he has never ordered a gézier salad again!! I really liked this, but it is the wrong colour for our house, so the credit card stayed safely in Chris’s pocket. There was no price on it and they do say ‘if you have to ask the price you can’t afford it’ and judging by the prices in general, they are probably right! So did we buy anything – well yes of course we got some olives! We then returned to Bize to find some lunch. Jambon et oeuf, couscous with salady bits, chicken curry (in the black pot) and rice with goat’s cheese on toast and crème brulée to finish off. It was all very tasty. We woke on our last day here to thunder and heavy rain which continued on and off all morning, however as it is the first persistent rain we have suffered since the journey down five weeks ago we are not complaining. I guess if you are going in the water rain is not a problem! What we should have done was release the sides of the sail cloth awning on the terrace! Still no damage was done and we moved the table and chairs before we let the water out. We have always noted the big drains they have round here and now we know why they are that big – when it rains it really rains! We had nothing planned for the morning apart from the rest of the packing, a trip to the hypermarket and to load the car with most of the stuff. Once that was all done we made the very long and arduous journey from our house (the blue door beyond the flower tub on the right) to the Café du Midi for another of their ‘tray lunches’. 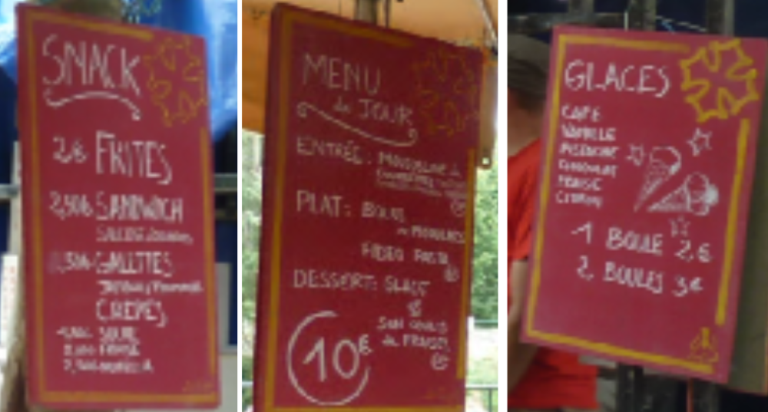 Today’s feast was goats’ cheese in a choux bun, an egg mayonnaise salad, pork and chips (they were truly excellent fries), a chocolate fondant and fruit salad with an expresso to end the meal – all for 12.50€. A pretty good deal in our opinion and no cooking for us tonight. Mind you in the five weeks we have been here we have only had the oven on three times – each time to cook 2 chicken breasts which we used in salads (half a breast each, so 12 servings) and I had cooked one tortilla and one omelette. We have lived very well on a large variety of salads. The emergency packet of pasta and jar of sauce is going home with us! The sun came out whilst we were having lunch and we enjoyed a quiet afternoon. There was some cleaning and food preparation left to do, but that as the say was it! All over bar the journey - something we are not looking forward to! So would we come again? Well yes we have to. 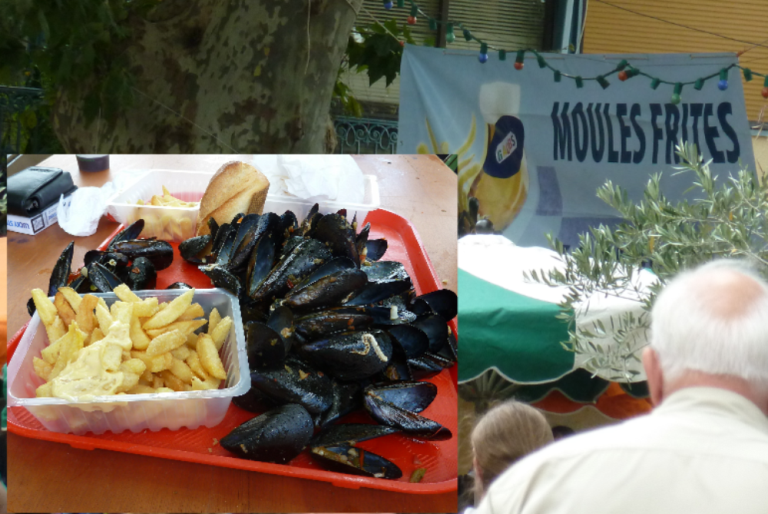 The timings of the entire trip were based both Bastille Day and the Fête d’Olivier (Olive Festival) that takes place in Bize Minervois every year. We thought it was always on the Sunday after Bastille Day, but sadly for us this year it was on Sunday 24th July – the day after we left!! All we saw of the 2016 event was preparation – cars had been moved from the promenade as that is where most of the action takes place. A generator appeared on the dry river bed. And the Café du Midi were preparing for a big group of Fête organisers in for dinner that (Friday) evening. We think there was another leg going to be added after we left at lunchtime. The final installment will cover what we missed - The Fête d’Olivier and the journey home.